Yaskawa Levanto improves the capacity of all conventional sheet cutters and eliminates all heavy, dirty, unhealthy and repetitive human working activities. This improves the working environment and the productivity of the operators. 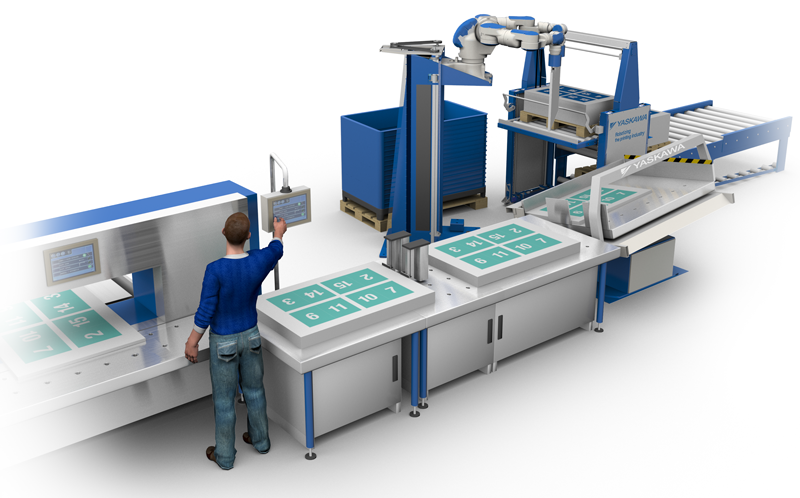 Yaskawa Levanto is the world’s first co-worker robot-cell for moving a stack of sheets from a pile to a vibration table at a sheet cutter line, while it at the same time gives the operator full control over the separation-, airing- and moving processes in relation to stack thickness, degree of airing, intensity and time of vibration and much more. Yaskawa Levanto profits from the skilled operators’ experience and knowledge in sheet handling, while it, at the same time, stores the same experiences for future use. In this way the operators can use their professional skills to cut the piles as fast as possible instead of performing time-consuming, heavy, repetitive work. 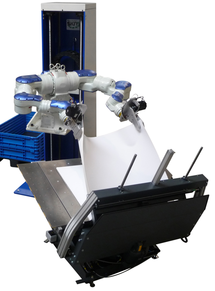 Yaskawa Levanto is based on Yaskawa’s dual-arm humanoid Motoman SDA 20 robot, which is the only robot in the world, which can copy the skilled operators’ movements of twisting the sheets in relation to each other in more directions at the same time to perform an efficient separation and airing of all sheets in a stack. The Motoman SDA 20 robot is positioned on a socket behind the vibration table to occupy minimal space and secure that the operator and the robot are in different, separated areas. This configuration allows the operator to work freely in his area, while the robot works in its area. This video shows how to feed a vibration table with sheets from a pile on a pallet in the conventional manual way.